Yoshiman is an old character who is a Yoshi with a rainbow spine, a leather jacket, and a sword. A later character, "DJ Yoshiman" was created and now serves as the current character; he is shown in the picture to the right. He operates as the mascot of the music of DJ Yoshiman. The member is a current member of both the MFGG forums and the main site. He used to be administrator and moderator of both the main website and forums. Please note that any mention of "Yoshiman" after this refers to the member, and not the character. 4 What does this guy do anyways? 5 What HAS this guy done, anyways? Ever since the days of Bowser Tech (watched and joined in 2000), Yoshiman has been interested in Mario fangaming (both aspects of playing and programming) for years. After finding out that Bowser Tech had changed into MFGG thanks to Thunder Dragon, he was overjoyed to finally go to a website devoted to Mario fangames. Over the years he matured. Every next game he would make would improve over the last. He was previously a loyal fan of Yoshi, and he's submitted 4 libs consisting of Yoshi sprites in the past, one of them being MFGG's "history-making first-ever N64 sprite." He has also submitted several howto's to the site, and was once moderator during the age of the EZBoard, but lost the power with a few others when the board got rid of EZBoard and moved to Invision. Yoshiman is an oldbie, being at MFGG when it was Bowser Tech. While most of the oldbies gradually left the forum, Yoshiman stayed, due to his obsession of Mario fangaming. Other oldbies stayed as well, others left and came back. Yoshiman is popular with many members, and used to be a good friend and a friendly guy to talk to on the forums. Yoshiman sometimes gets into arguments which are either given a solution or died out. He swore never to enter the Pointless Post Palace during the EZBoard days, but slowly began to post in it after the move to Invision. Yoshiman is also notorious for creating the "improved" version of Paper Mario World (turning it into Paper Mario World Gold, the version it is today) and having provided a voice in it. When Bowser Tech changed to MFGG, more people started to join. Yoshiman made many friends with people there, due to his friendly personality and the friendly personalities of others at that time as well. His first friend was Nite Shadow the Bio Freak, as they talked every single time each one was online to discuss fangames, life, and for him to show off his sprites and hoaxes. As time moved on, he created friendships with people like Cutman, Dark Yoshi, NeoSalen, Quickman, Neo Hyper Yoshi, Supernesfreak and Ricweb. He also created an RPG-like rivalry with Doctor Octopus, who kept wishing to kidnap Yoshiman's kittie, "Kishi." This went on for a while and enticed Cutman to create a game about it, called Kittie Quest. Later on, as people left and people joined, Yoshiman created more friends, while he still likes to talk to oldbies on AIM. What does this guy do anyways? Yoshiman was previously made a Fangame Discussion mod in the middle of 2007, where he could moderate a forum that closely tied in with his enjoyment and knowledge of the content for the forum. Later on, in November of 2007, he was upgraded to admin. He had done many things to the forum (both good and bad), including the introduction of the CCC (after Klobber had removed the PPP), the new name-change policy, his weekly announcements, the re-opening/creating of some forums, and even the Final Day Countdown. On March 10th, he de-adminned himself due to university work. However, on March 27, he was made a Global Moderator, after gaining increased flexibility in his schedule. Yoshiman requested to be de-modded from the MFGG forums on May 20th, 2008, due to several reasons. On November 3, 2010, he took over as one of MFGG's two Administrators when Kyori, Chaoxys, and Dex all quit. Two days later he announced plans that would drastically reshape the very structure of MFGG. On October 31, 2011, he resigned as admin of both the main website and forum, for reasons of serving the two places for longer than necessary. For recreational and career purposes, Yoshiman occasionally posts a new song or remix he's created in the Arts Board. He currently creates music, and DJ's. Yoshiman uses Clickteam for fangames, while other programs are made with programming languages like BASIC, Visual Basic and Java. What HAS this guy done, anyways? On 2001, Yoshiman worked on a fangame that was known as Yoshi Gone MFGG. He released a demo of it on 2002, and at some point, he stopped working on it. Yoshiman has worked with Shadowman to create NCFC, and since then has been producer of it for the years running so far. He also participated, lead the side of opposition and final-battled Zekewars in the Battle Without Honor or Humility event. As well, he has created the episodic trilogy What is This Thing? The third game in the series was released despite being partially incomplete. 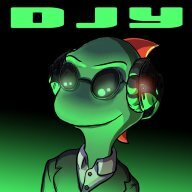 After some encouragement from the MFGG community, however, DJ Yoshiman has indicated that he'll try to finish the final episode. The PM fiasco happened the week of May 5th, 2008. When it was revealed that Yoshiman downloaded the PM database before he left as administrator, a wave of panic and hysteria erupted. Despite the claims that this was an isolated issue that was resolved long ago, people trounced on the issue, and Nightwing made a list of unverified claims against Yoshiman, and calling for Yoshiman's resignation. While Yoshiman may not have an immense number of posts, he does have a reputation for being a grumpy old elder and oldbie (who reminisces about the old days more than necessary). His attendance on the forums have been going on for so long that he has turned bitter in his old Internet age (which, in his opinion, grows quite more rapidly than real life age). He used to be a friendly, innocent, caring and encouraging type of member. His experience and observation over the years have changed that attitude, and while he retains his old attitude with friends, he remains neutral or sour with any one else. The struggle between his friendly, encouraging side and his more cynical outlook plays a key role in WiTT Episode Three. Yoshiman left all facets of MFGG and has cut all communication with other MFGGers on 2014. On July 27, 2016, Yoshiman went to the MFGG Wiki and asked if someone could get on contact with Thunder Dragon and let him know that Yoshiman apologized on his behalf regarding Toadette Strikes, would like to discuss Thunder Dragon's indie gaming direction, and have Thunder Dragon e-mail him, on his talk page. He explained that the reason why he wasn't around for a long time was because he endured a huge life change. Q-Nova and Nite Shadow did what Yoshiman requested. Yoshiman is currently the main composer for Psycutlery. It is currently unknown if Yoshiman will ever return to MFGG for real or not. This page was last edited on 10 January 2017, at 00:56.